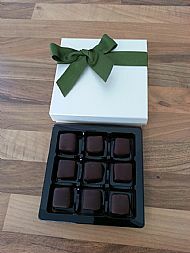 Hello everyone - we are pleased to announce our new product peppermint flavoured tablet coated in 70% dark chocolate in special gift boxes for Christmas. Available now in the online shop. Mother's Day will soon be upon us - why not treat your mom to a lovely box of Original Isle of Skye Tablet. If you visit my Facebook page www.facebook.com/IsleofSkyeFudge there is a promotion on there to win one of these special boxes of tablet. All you have to do is simply like and share the page with your friends. The winner will be drawn from all participants on Tuesday 6th March, ensuring enough time for the present to get to you for Mother's day. Alternatively you can order the gift boxes from the 'Shop Online' page. You may have heard that Isle of Skye Fudge Company will be changing hands at the end of January. That day has come! New owner Andrea Dukes will be taking over from 1st February 2018, and we have been working closely over the last two months to ensure a smooth transition. I hope that you will continue to support Isle of Skye Fudge Company as it moves to new beginnings. Andrea has worked at Skye Fudge for three years and, as good friends and neighbours, I know that I am passing the business into safe hands. I have been so fortunate that Chirsty MacKinnon, who first worked for us at the Glendale Watermill in her school holidays when we first moved to Skye in 1977, has been the longest serving team member since 2003. Noone, but noone, could have been so loyal and hardworking as Chirsty. The second longest team member is Leona Coull, who was 'second in command' and who made it all possible in the days when I was working fulltime and building the business. A natural team leader, always the calm amid the storm, Leona is a gem and one of the the best tablet makers in the world! Over the years people have come and gone, but I would especially like to thank Glenys, Janet, Laura, Fiona, Iona and Siobhan and everyone else who helped make the business such a success. While sad to see Isle of Skye Fudge change ownership, it is the right time for me to sell the business, as it is still growing - and I am ready to simplify my life! Finally, I’d just like to say a massive thanks for your support and feedback over the last fifteen years of trading, without which it would not have been possible to develop from a ‘wee bit extra for the holidays’ to a successful business making over 5 tons of tablet a year, still by hand! My first batch was produced in 2002 on a domestic cooker in the utility room, but before long I had to take over the kitchen of our self-catering unit. Six years later, we outgrew the house, converted the byre and moved into the new Skye Fudge kitchen in June 2009. What started as a part time business has grown way beyond my original intention to 'just supply the chocolate shop'. Little did I know then, that I'd end up becoming a chocolatier as well in 2010! Had great fun growing Isle of Skye Chocolate with a fab team of three, changing from a high street shop to a wholesale business supplying all of Skye and Lochalsh with sea-salted caramels in a milk chocolate truffle or tangy raspberry & balsamic cream ganache dipped in 70% dark chocolate, to name but a few from the delicious chocolate range! Having turned sixty in 2014, I decided it was time to hand over the business to someone who would take it to the next stage. It was a great pleasure then to sell Isle of Skye Chocolate to local businessman Angus MacRuary, former owner of the highly successful Skye Brewery. And so it's come full circle, and I am enjoying being back 'hands on' in the business, making bubbling aromatic pots of tablet, and creating and launching our latest product - Cuillin Mint Caketm. Skye chocolatier and fudgemaker Carole Inglis is handing over Isle of Skye Chocolate to new owner Angus MacRuary today (30 April) but will continue to run Isle of Skye Fudge Company as a stand alone business. Angus is well known to many on the island, having been owner manager of successful business Isle of Skye Brewing Company for 20 years. Carole Inglis established the business in 2009, having purchased some chocolate making equipment from Vanilla Skye when it ceased trading. 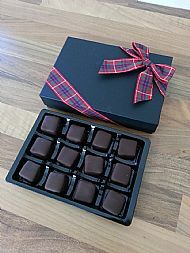 Since then, Isle of Skye Chocolate has developed an excellent reputation for its high quality handmade truffles which are sold widely throughout Skye & Lochalsh. 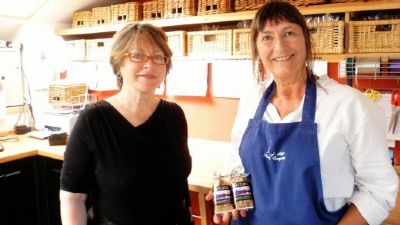 Angus added: “We don’t plan to change anything in our first year of trading as Isle of Skye Chocolate Company, and so have been working closely with Carole and her team to ensure a smooth transition for our customers. Our priority will be to maintain the very high standards that Carole and her team have set. Quite sure it's not only me, but I think I have just made the same resolutions as always...eat less, drink less and get fit. So, tomorrow - well it was my birthday yesterday after all - I will wake up ready for the challenges ahead! Fruit and yoghurt breakfast, omelette for lunch, and chicken or fish dish with lots of green veggies for dinner. And then, if I walk the dog every day, a sweet treat of my favourite sea-salted caramels and some Drambuie tablet at the weekend! When I came up with the strapline 'great taste, over the sea from Skye', I thought it would add a bit of romanticism to a take-home holiday gift for the many summer visitors to our beautiful island.